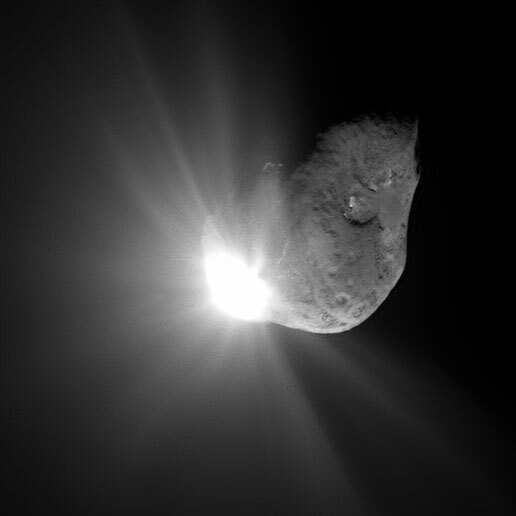 Comet Tempel 1 shortly after impact. Photo courtesy NASA/JPL-Caltech. Mojo and I wanted to be part of the community of worldwide eyes observing Comet 9P Tempel 1 last night, and we also hoped to share the view, if possible, with others. We showed the comet each night during the Grand Canyon Star party June 4 - 10 in the high altitude dark skies of northern Arizona when the comet was brighter and higher in the sky. But where could we observe it near our home in Monrovia, CA? A glance out the window of our guest room provided the answer. Mount Wilson Observatory! We belong to the Mount Wilson Observatory Association and have been wanting to volunteer at the 60-inch (152.4 cm) for some time. So I asked if the telescope would be available on the nights of the 3rd and 4th. The answer? Nope, the telescope isn't designed to be operated that low in the sky, plus high surface brightness objects look best, not faint comets, through this historic instrument. So I offered to give a short talk about the Deep Impact Mission and which observatories, space telescopes and amateur astronomer networks would observe the comet before, during and after impact. I suggested we bring our portable 17.5 (44.5 cm) and 14.5 (36.8 cm) inchers and set them up someplace with a view to the southwest at 10:52 p.m. PDT (05:52 UT July 4) last night. Last night was the first night of the annual two-week CUREA program on Mt. Wilson so we had a ready-made audience of enthusiasts to hear about Deep Impact and hopefully view the comet. While waiting for the marine layer to swallow some of Los Angeles nearly 6,000 feet below and to the south of us, we first observed Mercury and Venus low in the west. Farewell Saturn, it was already below the horizon at 8:30 p.m. when we began observing. Jupiter was our next target, then we aimed at a few deep sky objects such as the supernova 2005cs in M51. We each started to prepare for Comet Tempel 1. We brought printed charts using Skytools for the comet's position in Telrad, 80mm finder and eyepieces. It was easy to star hop to the comet's general vicinity as it was framed nicely by two magnitude 5 stars, 76 and 82 Virginis. Whenever I got lost, or let the object drift out of my 223x field of view, it wasn't hard to get back as the eyepiece view also contained two nice asterisms. Southeast (up in my reflector view) was a little Sagitta-shaped wedge which pointed right to the comet. Although neither of the software programs we used indicate a double star here I think magnitude 10.74 TYC 55486-782-1 ( BD-0803601 on Skytools) is a double star, or there was another similar magnitude star right next to it that is not charted on Skymap or Skytools. Just southwest (up in my view) of these two stars was a mag 12.22 star, TYC 05546-15581 completing the duncecap or Sagitta wedge. On the northeast side of the comet (down in my eyepiece) was another asterism, another triangle comprised of three mag 11 stars, TYC 05546: 0882-1, 1397-1 and 1273-1. There were lots of other roadsigns too, for example a "V" as in Virgo asterism with magnitude 8 TYC 5546-067-1 masquerading as a faint Vindemiatrix imposter. Did we ever see the comet? I thought I did several times with averted vision, and I made a rough sketch on my eyepiece chart, showing where I thought the comet was moving and which direction (if any) the tail was. Maybe I was using averted imagination, but I did think I saw the wedge shaped glow several times, and I confirmed the motion this morning. Some of the 15 or so viewers thought they saw the comet, but some did not. Mojo, using his 14.5 (36.8 cm) reflector, 19mm Panoptic and 2x Barlow (about 200x) felt the same way, unsure but suspecting a glimpse at the comet. But at a little after 11:00 p.m. Mojo announced to the group that he detected a faint star in the comet position, or what looked like a barely detectable faint grouping of stars -- one star with a faint compact glow around it. We all had a look. We felt sure we had seen the comet brighten, but then again, the marine layer was seething below. Our view seems to match other reports from similar instruments. Driving home, we heard radio reports of the mission success. What a thrill to view Comet Tempel 1. Transparency: LM 3-4, depending on marine layer obscuring some of LA.